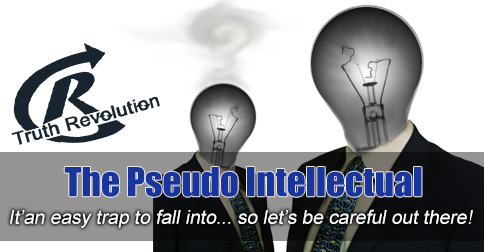 It’s way easy to go the route of the Pseudo Intellectual… we all do it… but perhaps we should be more careful! [audio:http://www.truthrevolution.tv/show/TS-0311.mp3]No Flash Support? Use this Audio Player! Dave: I read a study, and obviously , everyone knows, that orange is the best color. Jeff: What study? By whom? An actual researcher? Is this verifiable? Jeff: Why is it obvious? Does this word invoke discussion or shut people down? Jeff: Really? Everyone knows this… Is this even up for discussion? Apparently not. Dave: that orange is the best color. Dave: When you encounter a discussion with lots of phrases like that, you may be talking to a pseudo intellectual. Jeff: Even if there really was a study that said most people prefer orange, and it is completely true and acceptable in this conversation, his lack of bringing about a verifiable piece of information does not allow him to “win,” nor does it help anyone participate in learning or discussion. Dave: More on that in the next Truth Shot.